The Point House overlooks a small cove that faces westward for majestic sunsets. It is a unique and stunning location. The home sleeps four people quite comfortably--there are two private bedrooms, each with a queen-sized bed. The great room - two living areas, a dining area, and a kitchen separate the two bedrooms providing maximum privacy. There are two bathrooms--one is off of the great room and kitchen area and offers a step-in shower, and the other, in the master bedroom, has a step-in shower as well as a tub flanked by a window overlooking the bay. Plus - Eagle's Nest - a small loft area, bathed in sunlight (or cloud light) off the great room, with water view. A great reading place. The kitchen is well-equipped, with a full-sized refrigerator, stove and dishwasher. There is also a small refrigerator for beverages or extra refrigerated storage. On the water side of the house, there is a generous, two-level deck with railing and two picnic tables - one covered. A flight of stairs from the deck lands you on the beach for beach-combing, bird-watching and kayaking. Wildlife of all kinds can surprise you-- there are wild bunnies, quail, deer, otters and a wide variety of birds. Seen recently were a doe and her two offspring, ambling up the driveway. There is also another path to the beach with a kayak launch. There is a propane grill for grilling up your favorite meals, and outside tables enable dining al fresco. Please put it back in its original place as the wind can blow it around. There are plenty of comfortable chairs to encourage you to relax and enjoy the view. The house offers WiFi access and cable TV. There is a large, flat-screen TV in the great room for movie nights, and there are flat screen TVs in each bedroom. There are numerous outdoor tables, chairs, lounging areas. The Point House is located across Skagit Bay from the Whidby Island Naval Air Station. The navy/airforce practice formations during the week. Sometimes they are over La Conner, other times they are further south or north and we don't hear them. They do not fly Friday night, Saturday or Sunday. Some folks enjoy the formations, other don't like the noise. We want you to be informed as we never know when, or if, they will be flying (except NOT on weekends.) It is not take off and landing sounds, just a low roar in the distance. Please contact the Owner/Manager regarding pets. Children OVER 12 are welcome. WE DO NOT ACCOMMODATE CHILDREN UNDER 12 OR BABIES. We do not allow boats on trailers. Our kayaks are NOT for your use. The Point House is NOT CHILDPROOFED, AND CONTAINS SAFETY HAZARDS TOO NUMEROUS TO MENTION. The games we have at the house are adult games (chess, backgammon, Scrabble, etc.). The Point House is NOT A DESTINATION PARTY HOUSE. We are located in a peaceful, quiet community of full-time residents and ask that you observe common rules of consideration regarding noise and late-night activity. In particular, you must observe the 1 mph road sign. A NOTE TO KAYAKERS--The tides and currents are unpredictable at times and the wind can come up quickly, particularly in the late afternoons, creating a heavy chop on the water. Use caution, watch closely and bring life vests suited for the purpose. The kayaks and boats on the property are NOT for your use. You may rent kayaks at in Anacortes. Our family has been coming up here for years and we treasure the time we spend in this magical place. We are still actively using the house but would like others to enjoy it as well. With that in mind, we are looking for people who will really appreciate and respect the property and its contents. THE POINT HOUSE IS NOT CHILD-PROOFED, NOR IS IT SUITABLE FOR CHILDREN UNDER 12 YEARS-OLD OR BABIES. It is NOT a destination party house...rather, it is a place to come for renewal and enjoyment of everything the area has to offer. The house is situated in a unique, private and stunning setting, with great waterfront beach access and majestic views. It is close and conducive to an incredible variety of recreational activities--kayaking, biking and leisurely walks and hikes are just outside the door, and galleries, restaurants, shopping and antiquing await you in nearby LaConner. The views from the west side of the house are breathtaking...the moon rises in an arc over the deck and the jewel-like sun plays on the water during sunsets dazzles the eye. Seabirds on the nearby tidal lands and islands offer infinite entertainment for birding enthusiasts. You can watch eagles that are nesting nearby on a daily basis during nesting season in March and April...for much of the year, they are fishing in the area. The beds are really comfortable! toilet, tub, shower, Large soaking tub with water views. Washer and Dryer. La Conner is 4 miles away and offers great restaurants and shopping. The Skagit Valley produces world-famous tulips in the spring! We also have Native American canoe races. Hikes everywhere. You can see the Olympic Mountain range across the water to the west of Whidbey Island on a clear day. Expansive views of Goat Island and Whidbey Island through sliding doors to the deck. Sunsets are incredible! Easy beach access for beachcombing, birdwatching, kayaking. There is a walkway for launching kayaks. Our kayaks are NOT for your use, but you may rent them in Anacortes or bring your own. Propane fireplace. The wood fireplace is not for use. Sectional leather couch and regular size fabric couch. Plus - Eagle's Nest - a small loft area, bathed in sunlight (or cloud light) off the great room, with water view. A great reading place. Ice maker. Also, another small fridge for beverages. Spices, cooking oils, sugar, flour. Blender, waffle maker, pots, pans, bowls, cooking utensils, a full assortment of plates, cups, bowls and flatware. At check in, ask assistant to help - call 360-610-3279 if you need it. Other than steps to the beach, there are no steps. The Point House is NOT SUITABLE FOR YOUNG CHILDREN. Children staying or visiting who are over 12-years-old are welcome. Pet considered. Must be pre-approved. Contact Owner/Manager first. Amazing Views and Cozy Home! We saw Eagles, so many birds! A seal caught a fish and sat on a nearby rock eating it! We loved every minute and wish we could have stayed a lifetime! Lovely house with views out of almost every room. The sunsets were gorgeous, and the mornings were tranquil. I needed some peace and quiet, and this was perfect. I hope to return in the future. We enjoyed our stay very much and would definitely return. This house had everything we needed and the view was fabulous. We were fortunate enough to have sunny and dry weather with views for miles! The home was cozy and had everything needed! My niece and her friend from Nebraska were absolutely in love with the surroundings! 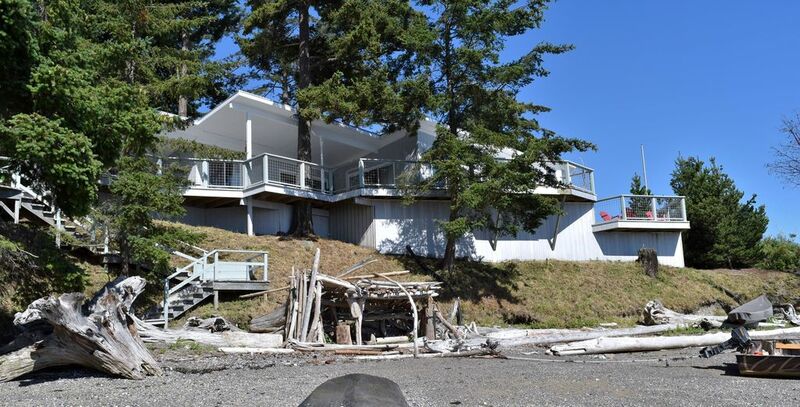 Close to downtown La Conner and Anacortes....this spot with views can’t be beat! If you are looking for a relaxing water front cabin, this is the spot for you! The owner takes meticulous care of this rental. It is clean, has nice linens, has a fully stocked kitchen, gorgeous water views, access to little beach cove, BBQ, and a lovely expansive deck. We enjoyed waking up on the water and then exploring the towns of La Connor, Mt. Vernon, and Fairhaven. Would definitely like to come back and enjoy a summer weekend as well! This property was absolutely STUNNING! I cannot say enough about how wonderful this home was. It was immaculate, well stocked with everything from extra blankets, toilet paper, paper towels, pots, pans, utensils, glassware etc., to olive oil and spices. We had plenty of privacy and the location was very quiet and serene. The only sounds we heard were the blissful sounds of the waves lapping on the beach and the eagles and other birds surrounding this location. The views are amazing from almost every location inside the home. The decks offered plenty of places to comfortably watch the ocean. There is a cozy gas fireplace that does an amazing job at being beautiful AND heating the room, and if you like to soak in a fabulous tub, this is the place for you! Judy was also amazing and available if we had any questions. The town of La Conner is close by and a great little town for visiting and shopping. They have a great brewery called La Conner Brewing Co. Anacortes is also quite close which is where you'll find a Safeway and Rockfish Brewing Company. We highly recommend going to Black Rock Seafood! They are a wonderful little store that carries fresh fish at a reasonable price. It was wonderful getting fresh fish and coming back to the house and cooking it up! We are already planning our next vacation there! Thank you so very much for sharing your wonderful home with us! It is truly spectacular! This area is a nature-lover's dream! There is convenient access to the Anacortes Ferry terminal for day trips to the San Juan Islands or Victoria, B.C.. Whale-watching and fishing tours can be booked in Anacortes, and the entire area is popular for bicyclists and hikers. Small plane airports in the area include Anacortes and Skagit Regional, and Bellingham offers the nearest major airport. There are airport shuttles between LaConner and Bellingham Airport as well as LC and Seattle. For golfers, some of the best public courses Washington has to offer in the area between La Conner and Bellingham, including (but not limited to) Avalon, Lake Padden, Eaglemont, Sudden Valley, Homestead Farms and Shuksan. The nearest course is Similk, on the way to Anacortes. Deception Pass State Park is nearby and the Skagit Valley Tulip Festival in the spring draws national and international visitors to the area every year. La Conner has, for years, been the residence of artists, brought to the area by the quality of light and supportive community. Author Tom Robbins used to live next door (to the north) and returned to the area after a time away. Other day trips in the area might include a drive to Whidbey island (no ferry necessary) for the mussels at Toby's Tavern in Coupeville, as well as jaunts to explore the surrounding farmlands and small towns where, during the summer months, one can fill up on an incredible bounty of local produce and berries. The emerging art scene in the tiny town of Edison (which also has a couple of wonderful bakeries) is certainly worth checking out. The nearby towns of LaConner, Mount Vernon and Anacortes offer display gardens, museums, galleries and great restaurants. Vancouver, B.C., an urban mecca, is about two hours away (you need a passport or card to cross the border). Seeds Bistro is consistently great and the desserts will melt anyone's willpower...the La Conner Pub and Eatery has the best fish/prawns and chips, period--try for an outside table if the weather permits, and watch working and pleasure boats drift by. For breakfast, the Calico Cupboard is always crowded and their breakfast pastries are famous. The Point House is located on the Swinomish tribe's reservation. One pet considered. Must be pre-approved. $25 per night. Check in time is 11:00 a.m. and check out is 4:00 p.m. unless otherwise arranged. 100% of money collected will be refunded if your reservation is cancelled 30 days (or more) prior to the first day of your stay. 50% of the rental fee is refundable with less than 30 days notice. Any damage deposits collected will be refunded fully, as long as there's no damage. Rates are subject to change until reservation is confirmed.